Al Lago is the kind of place you're tempted to keep to yourself. Sitting on the terrace overlooking the impossibly blue lake and tucking into the best dish of red tuna I’ve ever eaten, I was in a bit of a quandary. Al Lago is the kind of place you’re tempted to keep to yourself. But blogs are all about sharing, right? You get my drift. So what to do? Well, I thought, consoling myself with a perfectly chilled glass of Palacio de Bornos, since it’s featured on Little Hotels and One Off Places… not to mention having an “excellent” rating on TripAdvisor, the secret, if ever it was one, is already well and truly out. Less than a 90-minute drive from Marbella, Al Lago Hotel & Restaurant is in the pristine little village of Zahara de la Sierra, roughly at the point where the spectacular Serranía de Ronda meets the equally breathtaking Sierra de Grazalema. 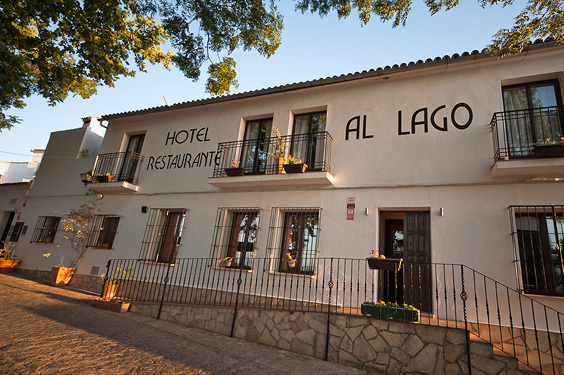 Although often passing nearby, I’d never been to Zahara – or for that matter Al Lago. Was I in for some surprises! Within seconds of turning off the A374 (Ronda – Sevilla road) and onto the A2300 (signposted Zahara) the lake – a reservoir to be exact but none the less stunning for that – appears on the right. Surprise number one. A few minutes later, and Zahara comes into view Surprise number two. Perched on a hillside and towered over by sheer vertical cliffs crowned with the ancient remains of a Moorish castle, it’s hard to imagine any passerby being able to resist taking a closer look. For me though, Al Lago was the best surprise of all. With its unassuming façade, at first glance it looks pretty much like any one of a number of ventas tucked away in the heart of the Andalusian countryside. But the clue lies in the dessert menu: New York-style Vanilla Cheesecake? Now that I wasn’t expecting! 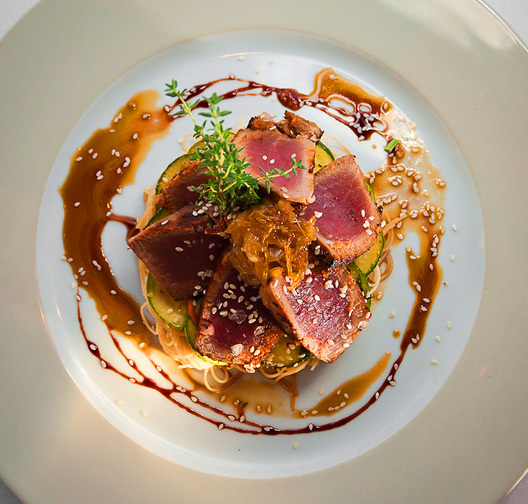 Red tuna on a bed of noodles with roasted vegetables and onion marmalade. 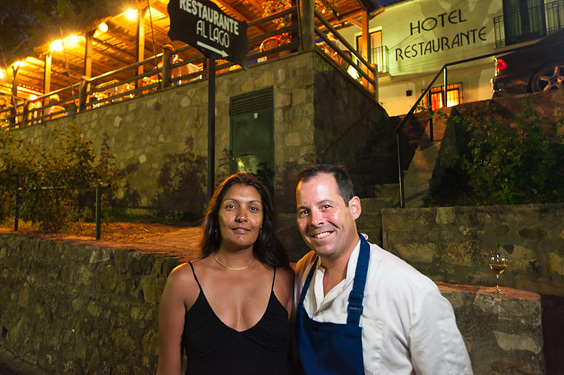 As it happens though, Al Lago’s talented chef, Stefan Crites – a native of Columbus, Ohio – spent 13 years perfecting his culinary skills in some of the best kitchens in the Big Apple, where he met wife Mona who manages the hotel and restaurant in Zahara that they’ve owned for five years. A former textile designer with her own boutique in New York, Mona grew up in England of Indian and Pakistani parentage and has drawn on her flair for design to create Al Lago’s simple yet comfortable décor. Mona and chef husband Stefan bought Al Lago 5 years ago. There are plenty of reasons for Al Lago’s enormous popularity. For starters of course there’s the delectable food – which Stefan describes as ‘Andalusian contemporary Mediterranean Spanish cuisine’ – the attentive staff, the four tastefully furnished en suite bedrooms, those stunning views and, it goes without saying, the welcoming hosts. 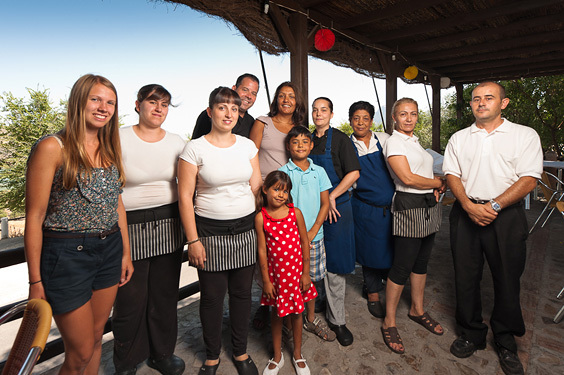 Mona, Stefan and their children Casim and Mahalia with the Al Lago team. The location is just about perfect, too, whatever you’re planning to do. It’s close enough to the Costa del Sol to stop off for a leisurely lunch while you’re enjoying a day in the country or maybe sightseeing in Ronda, but it’s also far enough away to spend the weekend – or longer – and there’s certainly plenty of things to do and places to see. Al Lago was the best surprise of all! With an emphasis on the very freshest of ingredients, the menus change with the seasons. The fishmonger visits from Cádiz three times a week, and in winter there’s also local game including wild boar and partridge. Most of the fruit, vegetables and salad ingredients are organically grown on Al Lago’s own smallholding. Only 30 minutes from Ronda and just off the road to Sevilla (105km), it’s also just 80km to Jerez and 120km to Cádiz, so it’s the ideal base from which to explore some of Andalucía’s most famous cities and quaintest of pueblos blancos. What with swimming and kayak fishing in the well-stocked man-made lake, horse riding along its shore, walking in the mountains, archery, bird watching, cycling along the Via Verde (a former railway line), and guided tours of the Garganta Verde gorge and the Cueva de la Pileta with its prehistoric cave drawings, there are loads of activities to keep all the family happily entertained. Then if you’re a bit of a foodie, to complement Al Lago’s fabulous daily specials and mouthwatering à la carte menus, there are a couple of traditional olive mills and the artisan cheesemakers to visit in Zahara itself. For wine buffs, trips to some of the region’s finest bodegas can also be arranged. From Indian feast weekends and Sevillana workshops, to gourmet breaks, Mothers Day weekends, spring and Easter breaks and family activity getaways, Al Lago hosts a full programme of events all year round. The location is just about perfect. 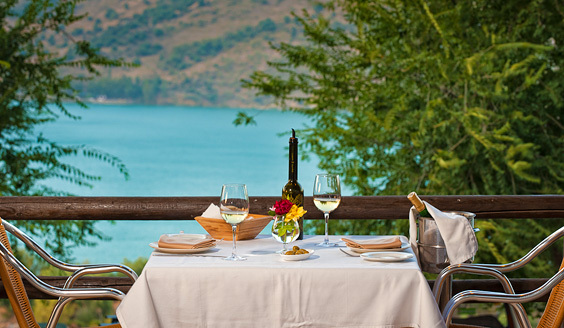 The lakeside terrace was full of people savouring their meal and drinking in the view. At the table next to mine the British family enjoying a villa holiday in Ronda told me it was their third visit to Al Lago in less than a week. Best to book in advance, then!